Most of the navigation menu is available to both logged in users via the left sidebar, and to visitors of the public website via the Explore drop down menu at the top of the page. My GovTribe - (Visible to logged in users only.) Where your personalized content resides. Your pipeline content, tasks, saved searches and notification settings. 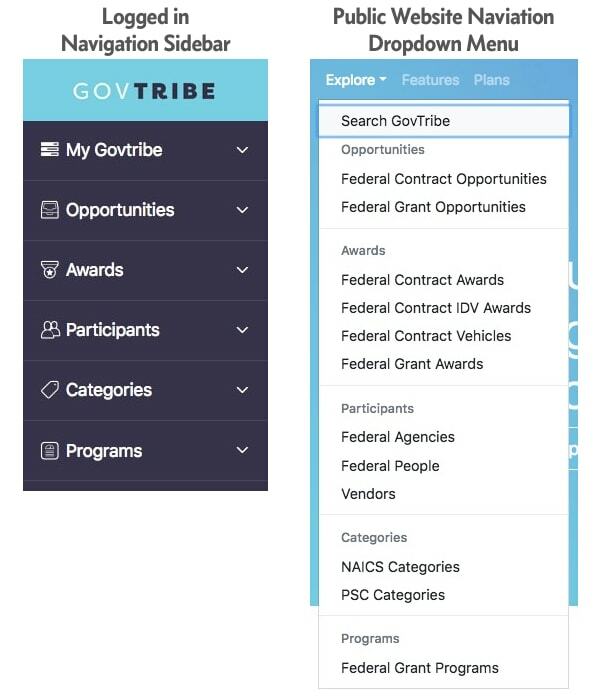 Opportunities - Contains the search pages for the types of opportunities you can find on GovTribe. This is where you find solicitation records, both current and historical. Awards - Contains the search pages for award and spending/obligation data. This is where you find award records, contracting vehicles, and financial data for existing and past contracts and grants. Participants - Contains the search pages for the players in the federal contracting and grant-making market - Agencies, federal contact persons, and vendors. Categories - Contains the search pages / browsers for the categorization systems the federal government uses - NAICS and PSC. Programs - Contains the search page for Federal Grant Programs. The My GovTribe section of the navigation menu contains four (4) items. Each menu item takes you to a search page / browser that allows you to search through and/or analyze some content that you (or your team members) have created on GovTribe. Dashboard - See a summary of key information about your Pipelines and about your company's recent and active federal award information. Pipelines - Browse or search through your (or your team members') Pipelines. Create a Pipeline. Pursuits - Browse or search through all your Pursuits across all of your Pipelines. Create a new Pursuit. Tasks - Browse or search through all Tasks created or owned by your or any of your team members, across all Pursuits and Pipelines (as well as those created independent of Pursuits or Pipelines). Saved Searches - View and access all of your Saved Searches, as well as those created by any of your team members. Explore - GovTribe global search. Search for anything and we'll show you the best matches across all of our search pages. The Opportunities section of the navigation menu contains four (2) items. Both items take you to a search page that contains opportunity information - both current and historical. Federal Contract Opportunities - Browse and search through current and historical federal contract solicitation-related notices and documents. Federal Grant Opportunities - Browse and search through current and historical federal grant application opportunity notices and documents. The Awards section of the navigation menu contains four (4) items. Each item takes you to a search page related to federal contract or grant award and spending information. Federal Contract Vehicles - Search the top level of the contract data hierarchy - the Multiple Award Vehicle (or Master Vehicle) level - which contains named Federal Supply Schedules, Governmentwide Acquisition Contracts, Indefinite Delivery Contracts, and Blanket Purchase Agreements. 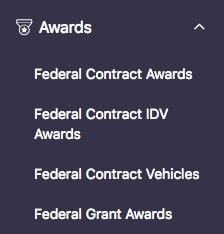 The final item in the Awards section of the navigation menu is related to federal grant awards and spending. Federal Grant Awards - Browse and search through current and historical federal grant award and spending data. The Participants section of the navigation menu contains four (2) items. Each item takes you to a search page for one of the players, or "participants," in the federal contracting and grant-making market. Federal Agencies - Browse and search the federal agency buyers at all levels of the organization structure for the government. 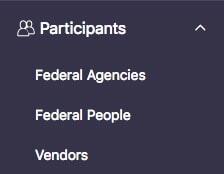 Federal People - Browse and search the government points-of-contact associated with federal procurements, contracts, and grants. Vendors - Browse and search for companies that perform work under, bid on, and/or are registered to bid on federal contracts and grants. The Categories section of the navigation menu contains four (2) items. Each item takes you to a search page for one of the categorization systems the federal government uses to organize and describe the nature of the contracts it awards, as well as the companies that compete for them. NAICS Categories - Browse and search the North American Industry Classification System (NAICS) categorization system. PSC Categories - Browse and search the Product and Service Code (PSC) categorization system. 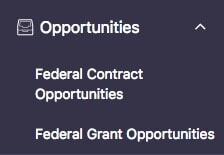 The Programs section of the navigation menu contains just one item - the search page for Federal Grant Programs. Federal Grant Programs are functional goals or funding priorities for the federal government associated with grant awards and funding. When doing a keyword search on the global search page, GovTribe's search engine provides you the highest value hits against all of our searchable content - everything except what is contained under "My GovTribe".